Today am I going to review one more product from my favorite brand Fuschia. In case you don’t know my love for the brand, check out my previous reviews of Fuschia day and night cream and sandal saffron bath salt. These are newer upcoming brands and many people are still unaware of it. But trust me, all Fuschia products I have tried have worked awesome for me and the results are almost equivalent to bigger, established brands. If you ask me, as a beauty blogger, I would suggest you to ditch all chemical-laden products you have on your shelf and shift to natural, handmade and paraben-free products. Your skin will definitely thank you and breath a sigh of relief! 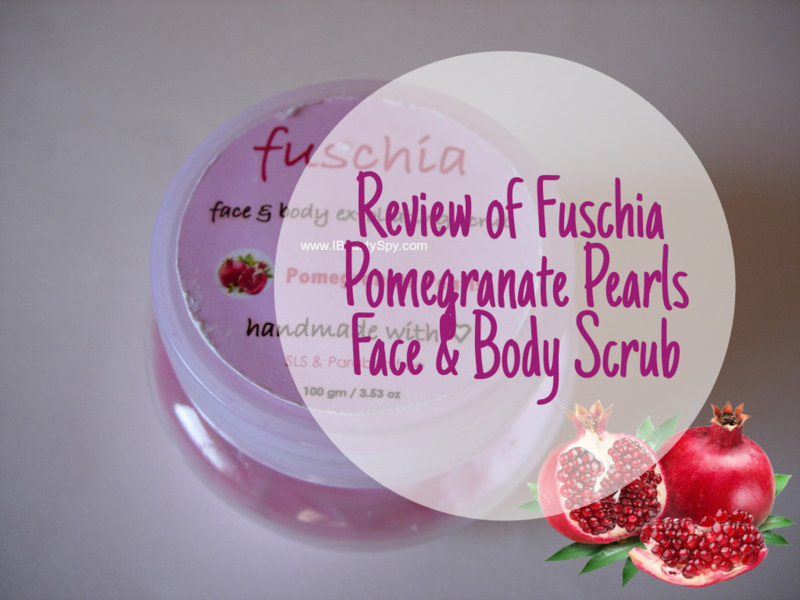 So let’s move on to the review of this Fuschia Pomegranate Pearls Face and Body Scrub. Enriched with Pomegranate ( punica granatum ) extract, a rich antioxidant, Fuschia Face & Body scrub gently exfoliates dead skin cells, unclogs pores, detoxifies & moisturizes skin. Delays fine signs of ageing making the skin feel younger. Free of parabens, phthalates, petroleum base, artificial tints & synthetic perfumes. Just like the skin cells on your face, the cells on your body regularly shed to reveal new, healthier skin underneath. That turnover process slows as we get older; to give it a nudge, reach for Fuschia – Pomegranate Pearls – Face & Body Exfoliating Scrub. By removing the dead skin cells, you’ll avoid splotches and dark spots, especially around your knees and elbows. As much as I prefer heavy duty sugar and salt scrubs in summers for a deep cleansing effect, they can be a little harsh during monsoons. In this monsoon weather, our skin tends to become drier and we need something more milder and moisturizing. Enters Fuschia Pomegranate Pearls Face and Body Scrub which is gentle and calming as the rains! Enough of ranting! The scrub comes in a jar packaging. I have the old packaging which is round and there no ingredients or product claims mentioned in it. But now they have come up with a new packaging which is similar to the day and night creams – a square jar. And the ingredients list are printed on the lid. But I find only the key ingredients. I wish they would print the complete ingredients list. 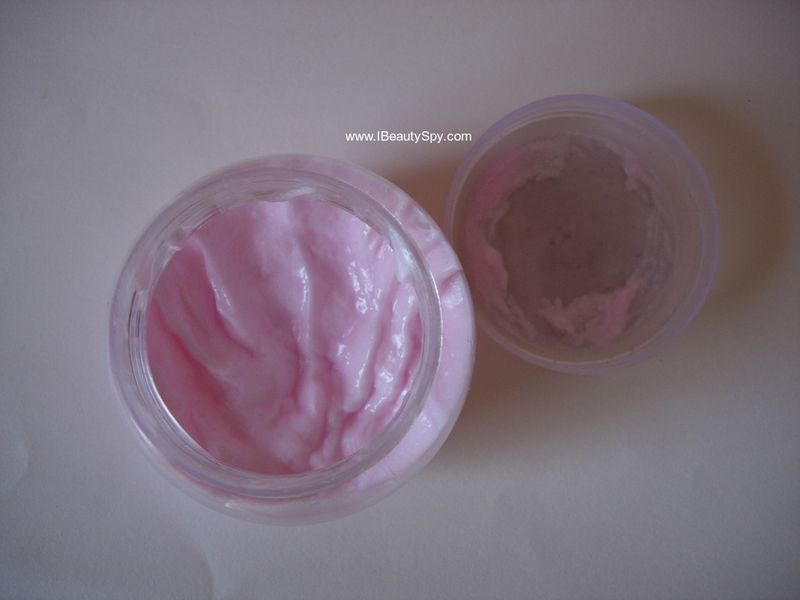 The scrub is light pink in color and the consistency is creamy but not oily. The scrub particles are very tiny and not harsh on the skin. The fragrance is natural and very similar to having fresh pomegranate juice. Those who love pomegranates will find this refreshing. This is a dual-purpose scrub and can be used for both face and body. As its mild, I use it around 3 times a week. While massaging it, it feels very soothing and calming unlike regular sugar and salt scrubs. Though the scrub particles are tiny, they are very effective in exfoliating and removing dead skin cells. My skin feels so so smooth and without any dryness. The scrub is very gentle and can be used by sensitive skin also. I have used it on my face and it is effective in removing blackheads, whiteheads and unclogs pores without hurting the skin. Yes, it satisfies all its claims. It exfoliates dead cells, unclogs pores, detoxifies and moisturizes skin. Skin feels smooth and younger. * Effectively removes dead cells and unclogs pores. * Makes skin smooth and younger. * Can be used both on face and body. * Calming scent of fresh pomegranate juice. * Suitable for sensitive skin also. * Enriched with pomegranate extract which is rich in antioxidants. * Free of parabens, phthalates, petroleum base, artificial tints and synthetic perfumes. * Mention complete ingredients list. Maybe. But I would like to try their other variants of body scrubs. 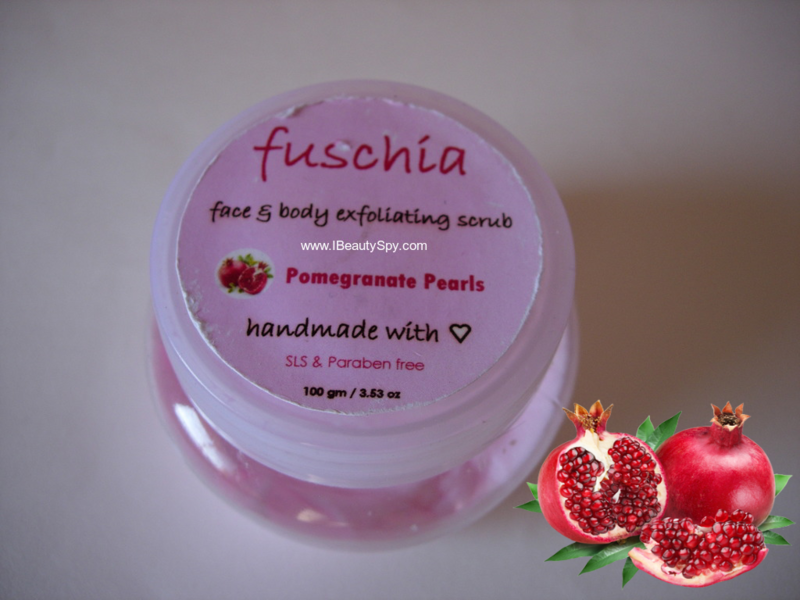 Well, so if you are impatient like me to deseed the pomegranate fruit and blend it into a scrub and slather it all over your body, then just grab this jar of Fuschia Pomegranate Pearls Face & Body Scrub and scrub your way to smooth and young skin! As for me, its the third Fuschia product that am totally in love with! Which Fuschia products have you tried? Share your favorite body scrubs in the comments below. Yes, all Fuschia products are really good. They have just started, so you might not have heard. Recently Posted: When Celebrity Plastic Surgery Goes Spectacularly Right ! Food? :)))) Thanks for review. Nicely reviewed , i have tried Fushia soaps , they are good . Thank you Sumita. You can try Biotique Baby Care range. They have an entire collection of products for babies. And its all natural, ayurvedic and preservative free. I like this scrub a lot.